How do we talk about and combat racism? 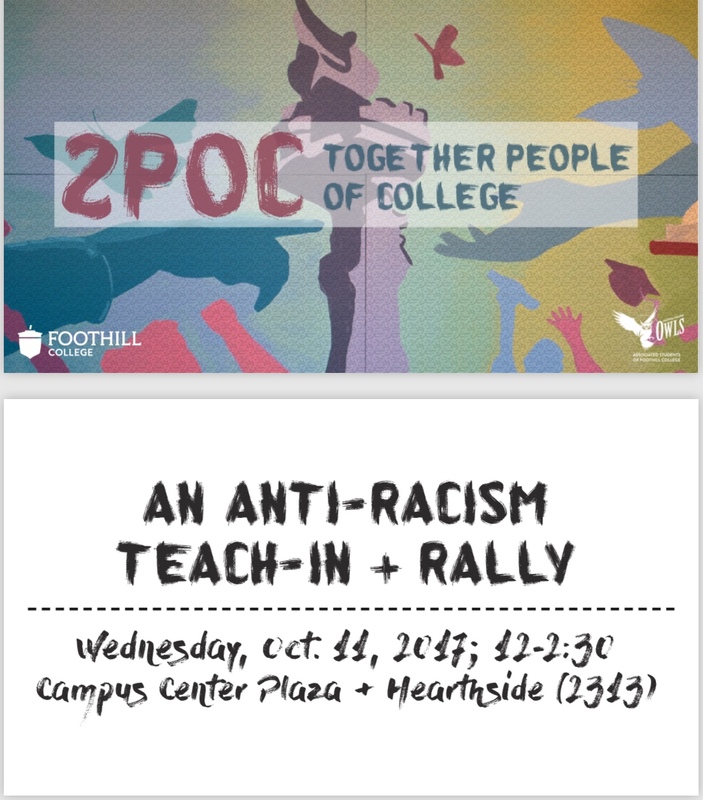 Foothill students, faculty, and staff will give short talks on techniques to actively promote anti-racism in the classroom and beyond. BE RESPECTFUL and SUPPORTIVE: Presenters and Participants must all work together to maintain a respectful and supportive environment. ENTER and LEAVE QUIETLY: Audience participants are welcome to enter and leave in-between Ten Minute Teach-In Talks. You do not need to attend the full 2.5 hour event. ASK QUESTIONS POLITELY: Thoughtful and appropriate questions may be addressed to presenters during the brief 5-minute periods between presentations. Please raise your hand to be called on. COMMENT ON SOCIAL MEDIA: Please comment and contribute to our social media pages (TBA). LISTEN AND DISCUSS what you learn outside in the Campus Center Plaza. CONNECT WHAT YOU LEARN to your own communities, clubs, and classes. SPEAK OUT AGAINST RACISM wherever you find it. "On DACA and Being a Dreamer"
"On the History of U.S. White Supremacy"
"On Attempting to Dialog with the Alt-Right"
"On the Colin Kaepernick Controversy"
"On Racism from a Native Perspective"
"On Racism in the Foster Child Syndrome"
I would be more than happy to add any relevant materials or resources!